Earlier this month, we were thrilled to learn that Flash Point Communications was honored at The 2010 SAMMY Awards in New York City. 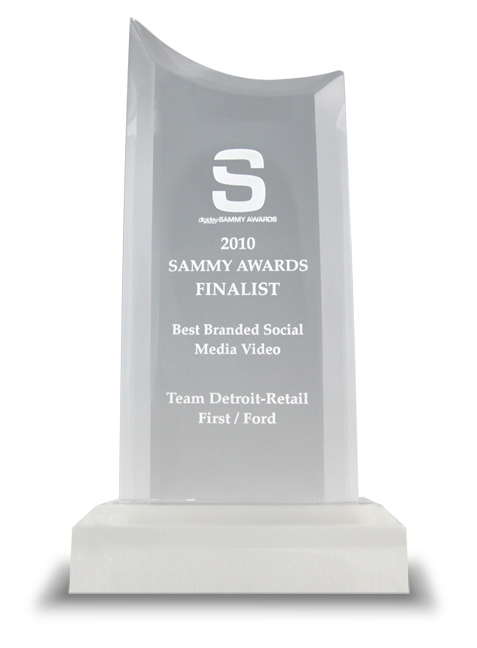 Each year, the SAMMY awards recognizes standout achievements in Social Advertising, Media, and Marketing. What an honor to be recognized at this prestigious awards show, and even better yet, to have made it as a finalist! Flash Point, in partnership with TeamDetroit, was recognized for our innovative (and funny!) social media campaign for the Northwest Ford Dealer Association, in the category of Best Branded Video Campaign. The video "Showroom Rap" promotes the 2009 Ford Focus with a humorous new take on the old Candid Camera concept, capturing customer reactions as a Ford salesman unexpectedly bursts into a musical rap during a typical showroom demo. Check out the creativity as our very own under-cover rap artist breaks down the A-B-C's of the 09 Focus, highlighting the vehicle's features. The best part is watching the enthusiasm build as actual customers start to join in the fun! After the initial full-length video was released on the Northwest Ford YouTube channel, a flood of additional remixes and extended versions were released to continue the campaign's buzz....leading to the video becoming the #1 search result for keyword "Ford Customer Service" for both YouTube and Google Video. From the YouTube channel, viewers were encouraged to visit the Northwest Ford website, where they visit an online showroom and take a cool "virtual test drive" of the 2009 Ford Focus. Once the customer enters his name, the test drive launches a personalized vehicle demonstration. Check out the virtual test drive and take a spin in the Ford Focus yourself! After the viewer kicks the Focus's virtual tires, a personalized email lands in their inbox directing them to their nearest Ford dealership where they can experience an actual test drive. These leads were then directly channeled to that particular dealership for follow-up. Slam dunk! Congratulations to the entire team and special thanks to The SAMMY Awards judges!